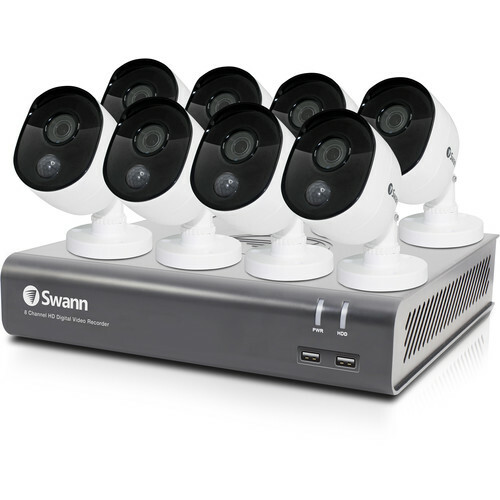 Monitor your home or business with the 8-Channel 1080p DVR with 1TB HDD & 8 1080p Outdoor Night Vision Bullet Cameras from Swann. The DVR comes with a preinstalled 1TB HDD to store video from the included bullet cameras. HDD storage is expandable to 4TB. With the free HomeSafe View app, remote viewing can be accessed via iOS and Android mobile devices, or a Windows or Mac PC. The included bullet cameras capture video at a resolution of 1920 x 1080. They each deliver a 102° field of view and up to 100' of night vision. Additionally, they all feature a PIR motion sensor with a range of up to 32', enabling the cameras to detect people, cars, animals, and other large heat-generating objects. The cameras are each housed in an IP66-rated enclosure, making them suitable for outdoor use. Box Dimensions (LxWxH) 15.5 x 12.5 x 12.0"
8-Channel 1080p DVR with 1TB HDD & 8 1080p Outdoor Night Vision Bullet Cameras is rated 5.0 out of 5 by 1. Rated 5 out of 5 by Angel from Easy set up Great picture quality even at night. The hardest part of installing this is running the cables, not really difficult but time consuming. I have installed 2 previous systems in my home from a different brand and the Swann by far was easiest to set up for remote viewing, download the app follow the included instructions and in about 5 minutes I was viewing my cameras on-line. Great wide angle lets me capture more than my previous cameras. Wired, they come cable with connectors.